Enter the large welcoming foyer at your own risk of being wowed by the extravaganza of mesmerizing proportions at this 270m² (approx) family home, starting with a 50m² garage and a huge guest room downstairs with ensuite and its own private courtyard, then climb up the stairs to find the elegant Rimu kitchen, with open plan living, opening out onto a superbly sunny deck, just awaiting your outdoor living privacy, with tantalizing views of the Richmond hills and the spread of Richmond itself, and of course the blue waters beyond. This level also accommodates 2 double bedrooms and the main bathroom. 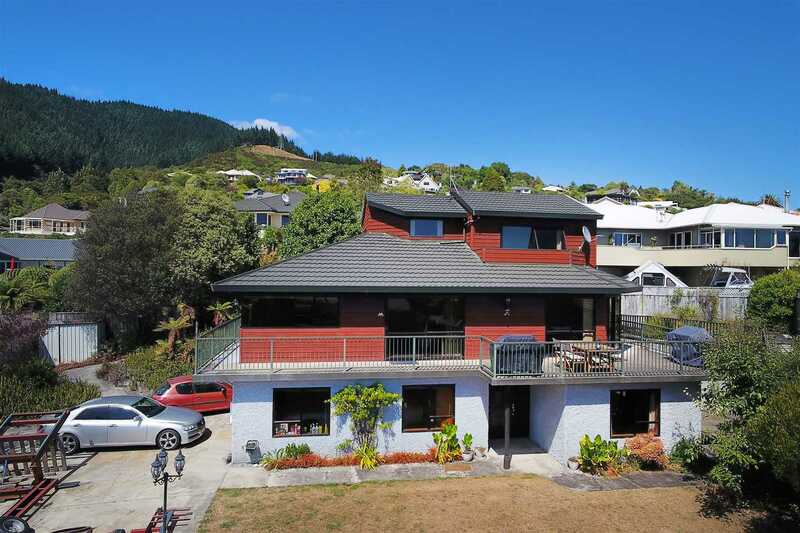 Venture further up the stairs, if you dare, to find the main bedroom, with ensuite and a private balcony, for you to take in the superior outlook of the Tasman Bay, and marvel at the sprawling green elegance of the neighboring park, Delside Reserve, with its wonderful walkways. Come visit this prominent abode, only minutes away from the amenities of Richmond, and bound to attract one and all. Don't miss out, Call Michael Now! Chattels remaining: Blinds, Fixed floor coverings, Light fittings, Stove, Drapes, Dishwasher, Rangehood, Bathroom Heater, Clothes Line.